Melanie worries that Harold might be her secret admnirer when he compliments her in the Coffee Shop. Joe is worried about the insurance - they refuse to pay the full amount that the stolen tools were worth. But he thinks it's all sorted now. Kerry tells Joe that they could move to the country. Joe would like it, but thinks it might not be practical. Kerry says that there's schools for the kids there and they'd be away from the city hassles. All the teenagers of Ramsay Street are hanging out in the pool. Melissa is telling them about school the the USA and is playing it down. But Todd starts asking about Neil. Melissa glowers at him - they agreed to drop the subject. Melissa gets angry and Todd stalks off. Nick, Lee and Sharon look confused. Madge and Harold are finishing their packing for their trip. Bronwyn says she might ask Sharon to move in for a bit while they're away. Harold asks Bronwyn to keep an eye on Gloria at the Coffee Shop - he's worried about Gloria's behaviour! Melanie comes round and tells Bronwyn that she thinks Harold is her secret admirer - he gave her flowers at the Coffee Shop! Joe is thinking of the practicalities of moving to the country, like renting out the house and how upset Harold would be if they went away. Des comes round and tells them about his motivational course. Joe thinks it's rubbish but Des tells him all about taking control and changing your whole life. Kerry agrees with this and tells Des they're thinking of moving. Des says all they have to do if get the idea in their mind and go for it! Sharon asks Melissa what's going on with Todd. 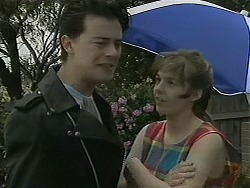 Melissa is exasperated by Todd's jealous behaviour. Sharon suggests giving him something to really be jealous of, so Todd will smarten up his act. Oh dear, this doesn't sound good. In the pool, Nick and Matt are trying to reason with Todd. But he says he doesn't know how he feels about Melissa anymore. Matt warns him to make up his mind quick in case Melissa is snapped up by someone else. Bronwyn is telling Melanie that it can't possibly be Harold. Harold comes out and says he's really looking forward to the trip - it'll be like a second honeymoon. Melissa tells Todd that Matt is a cool bloke. She starts saying how nice he is and how mature. She wants to go swimming at No.30 again tomorrow. Todd isn't happy to be talking about Matt and Melissa smiles knowingly. Nick, Sharon, Matt, Bronwyn and Lee are playing Pictionary. Sharon is looking forward to moving in with Bronwyn for a bit. Bronwyn tells her that it's not an opportunity for a wild party. Melanie is just finishing her story to Des. He wakes up(!) and starts telling her all about team spirit. Also that she shoudl think about the effect she has on other people's lives - and how much she's helped him get over his awkwardness with women. DES: No man is an island! Melissa left her purse at No.30 so has called round to get it back from Matt. When she sees Todd coming, she asks Matt for a ride and he agrees. Todd looks outraged! Madge and Harold are about to leave on their trip, so Bronwyn and the Mangels are saying goodbye. Kerry mentions that they're thinking of moving to the country. Harold looks rather upset - he's miss them. But there's no time to discuss it now - so Harold makes her promise not to go before they get back from their trip. Melanie is exercising and Des is complimenting her on her appearance. Melanie quickly puts a dressing-gown on(!) Des suggests they could do more motivational stuff tonight after work and Melanie looks worried again! Todd has come to confront Matt about Melissa. Todd tells him to lay off Melissa or else!